As you know, we are expecting baby #4 in about 6 more weeks. 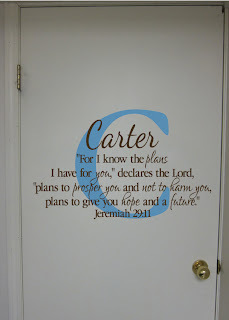 I wanted to change up the nursery a bit because it needed a fresh paint job after about 9-10 years and I really wanted a Scripture wall decal this time around. 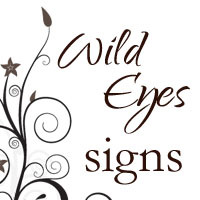 I found one from Wild Eyes signs that I really liked. 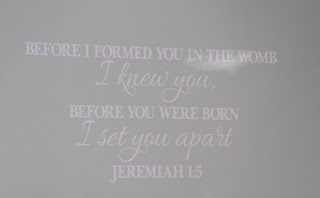 The Scripture was perfect and I loved the style Tyneille, the creator behind Wild Eyes signs, chose to do it in. The Scripture I chose is Jeremiah 1:5, "Before I formed you in the womb, I new you, before you were born I set you apart." (Please ignore the light shining on the decal!) I am super happy with how it turned out and every time I go into the nursery I think about how much I love it! Tyneille, the creator and owner of Wild Eyes signs is fantastic to work with! After choosing what decal I wanted, she happily sent me samples of colors to choose from, as well as some test letters. 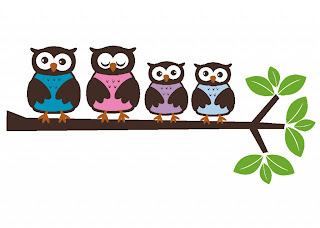 AND, prior to that, she emailed me a few color options for the decal and showed me what it looked like in the actual nursery picture I sent her. I was very impressed with her helpfulness and would definitely order from Wild Eyes signs in the future. As far as installation, the decal was super easy to put up. I simply peeled the back layer off, placed it where I wanted it on the wall, and used a Pampered Chef scraper (or you could use a debit card) to adhere the decal to the wall. Couldn't have been more easy to add a great look to a room. Tyneille has lots of styles to choose from in her Etsy Shop and she also does custom orders. If you're curious as to what types of surfaces you can apply these decals to, check out her FAQ section here. But just so you know, you can put these on just about anything! Here are a few of my favorite decals, but be sure to check out her website or her Facebook page to see her large collection. 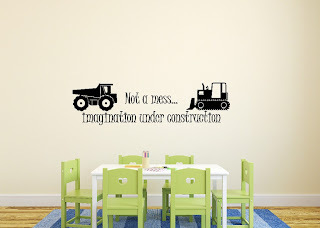 Tyneille has decals available for the home, bedrooms, children and teens and even for commercial use. And, guess what?? Tyneille is graciously offering one of my readers a chance to win a free decal worth $40 or less of their choosing. Simply enter the Rafflecopter form below for a chance to win! I think I would get the 1 Timothy 4:12-Teen Wall Vinyl-Bible Scripture wall vinyl -22" X 28"